Cellfina is the only FDA-cleared, minimally invasive procedure that has been clinically proven to significantly reduce the appearance of cellulite. Finally, the cellulite solution that you and your thighs have been waiting for! As one of only 4 offices in the Mineola and Lower Manhattan areas to perform this treatment, we guarantee that the opportunity for you to receive this revolutionary, in-office procedure is as exciting as it is exclusive. What is the Cellfina™ System? 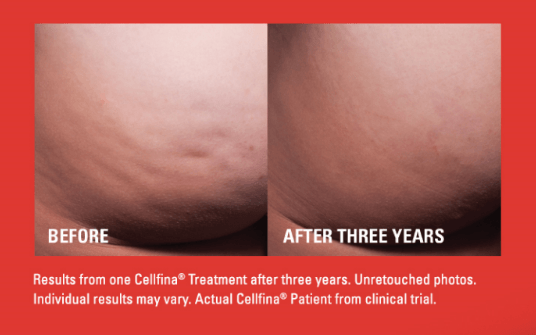 Cellfina™ is the only FDA-cleared minimally invasive, one-time procedure clinically proven to improve the appearance of cellulite for at least two years—the longest FDA-cleared duration for a cellulite treatment. A straightforward solution to cellulite, Cellfina™, combines a proven approach with innovative, proprietary technology, to produce precise, long-lasting results. Patients in the pivotal study showed significant improvement shortly after the treatment, with results lasting at least two years — the longest FDA clearance for a cellulite treatment. Click each photo below to view larger versions. No serious adverse events were associated with Cellfina™ in the pivotal study. The most common side effects reported by patients in the FDA cleared pivotal study were soreness, tenderness and bruising. Just three days after treatment, patients rated their pain as minimal (2.7 on a scale of 0 to 10; 0=no pain, 10=extreme pain) and most (82 percent) felt pain only with touch or pressure to the area treated. This minimal pain improved quickly with time. More than 90 percent of patients had no bruising at four weeks. In just one 45-minute treatment, Cellfina™, significantly improves the appearance of cellulite on the buttocks and thighs. There is limited downtime associated with Cellfina™. Some patients experience initial soreness and tenderness, but these side effects resolve quickly with time. The Cellfina® Yearlong Assurance (CYA) Guarantee allows us to guarantee patients their results for up to a year at no additional cost. Call us to learn more!